Serve tacos and all the fixins with this convenient kit, all contained in a handsome wood box. 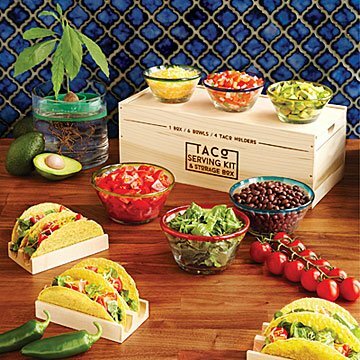 Set out a festive table spread for Taco Tuesday (or Monday, Sunday, and any day in between) with this all-in-one serving and storage solution, featuring six glass bowls and four taco holders. The bright, color-rimmed glass bowls are hand blown in Mexico and come in two sizes--three large for your favorite fillings, and three small to hold condiments or shredded cheese. Each taco holder holds two hard or soft shells, letting you easily fill without spilling. A sleek pine and birch box keeps the set contained, making it easy to stay organized for all your fiestas. Box and taco holders made in Wilton, Maine. Blown glass bowls made in Mexico. Glass: Dishwasher safe. Wood: Hand wash with warm soapy water and dry immediately. The walls of the box are made of natural poplar hardwood. Wood coloration will vary from light cream to yellowish brown, with occasional streaks of gray or green. I purchased this for our 2nd home which is in the desert. I've been looking at it for a while and finally ordered it. I'm so glad I did as it makes serving tacos so much more fun. But I especially love the bowls. They are heavy and very attractive. They have so many other uses. I would definitely recommend it! I was eying this product for a while and when I decided to buy I was not disappointed. My kids specially loved eating their tacos that night! Would be perfect for gifting. Love the fun products from Uncommon Goods! I wanted to order this item last year and it sold out. I bought the wine glasses for him instead and he loved them. He and his wife are taco fanatics so I'm quite sure the taco kit will be a big hit. You have quality products and the ordering process is simple. Love the quality of the glass. I am going to buy one for myself!!! This product looks exactly like it does in the picture. The quality is excellent and the the rim of the bowls bright and colorful ! My sister who lives in San Diego cooks Mexican quite a bit... she loved,loved,loved this! Very nice product with its own storage case. Love it!! !